Nothing is what it seems these days in the world of 4WD vehicles. We have some pretending to be coupes and sports hatches while others appear to be full-fat mud pluggers but actually only have front driven wheels. The Vitara is a model that has always remained true to its original concept dating back to 1988. It's a compact off-roader that sits neatly in the middle when it comes to a balance of on and off-road prowess. In its 3rd iteration it’s a model in Suzuki's line-up that should hold plenty of appeal. If anything it’s a concept that Land Rover cashed in on with their Freelander over a decade ago but have since disappeared off in the direction of the premium, luxury horizon leaving the Vitara where it left off. Having been on sale since 2005 how good is Suzuki’s pint sized jack-of-all-trades? On paper the Vitara has all of the vital ingredients it needs to succeed both on and off road. All-wheel-drive with low and high ratio lock modes, good ground clearance and short overhangs. For the road a small, frugal but perfectly formed 1.9 litre diesel engine donated by Renault and road tyres along with standard fit cruise control on this top spec SZ5 model. Not forgetting full heated leather seats. To try and work out if the Vitara can ‘cut-the-mustard’ I decided to put it through its paces on a drive from Oxfordshire to Merseyside and back again covering a total of 400 miles in a day. Then the following day it would be time to tackle the ‘rough stuff’ to see how good the Vitara is off the beaten track. Read on to find out how it performed. 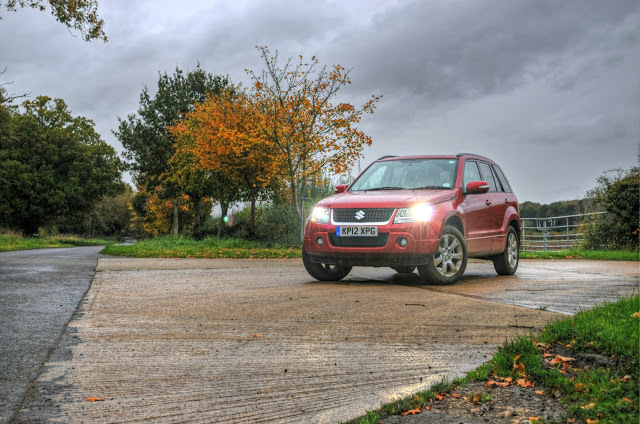 Visually the Vitara hasn’t really changed much since it was launched over 7 years ago and its still not a bad looker. It’s a simple design that’s well-proportioned and thanks to its big wheels, beefy arches and boxy shape it looks as butch as any of its rivals. The top spec model you see here also benefits from projector lights but has lost its boot mounted spare wheel to save weight making the rear look a little sorry for itself. Expecting any vehicle with big 18 inch wheels, high ground clearance and a squared of shape to offer luxury levels of quietness would be silly. However the Vitara most of the time is very good indeed. Wind noise is well contained and roar from the tyres only becomes tiresome on concrete motorway surfaces, both around town and on country roads passengers will remain unruffled. It also rides incredible well with enough suppleness to take the sting out of rutted roads but it has a firm edge that keeps any wallowyness at bay. The engine on the other hand can be clattery when cold and under moderate acceleration but when cruising it’s barely audible. Carrying all that off road engineering around means that the Vitara tips the scales at 1654kg, which is actually not that far off a similar sized Focus. The powerplant under the bonnet misses out on the additional 8 valves of most rivals but still manages to return decent economy. The majority of our jaunt to Merseyside was traffic free but very windy. On average we returned a very good 31.9 mpg. Considering the tiny 4,500 mileage of this particular example we were more than happy even if it was some way off the claimed 42.8 mpg combined. We also thought that £195 per year (Band H) to tax this Vitara is also not to be sniffed at..
Handling and four wheel drive cars very rarely go hand-in-hand. This was another area that surprised us. Thanks to independent suspension with sensibly calibrated springs and dampers bodyroll is well controlled, grip levels plentiful and the steering beautifully weighty and much pointer than its piers. On the limit it's mechanical grip levels are reassuring and the standard fit ESP only intervenes when absolutely necessary. We didn't get on so well with the agricultural 5-speed gearbox that felt rubbery, vague and hated to be rushed. The lever also vibrates and wobbles around when stepping on and off the power with a noticeable amount of driveline shunt too. Few will be disappointed with the Vitara's cabin. Space if plentiful with a good sized boot, its side mounted hinges are a great feature carried over from previous incarnations. Rear accommodation is also good for a car of this size with plenty of room for three and seats that tumble and flip forward like in an mpv. The design of the cabin upfront is very strong. Everything feels well screwed together with a good choice of soft touch materials on the dashboard top and more robust -but still very appealing - materials lower down. The design itself still looks remarkable fresh including the cowled dials and centre stack. Reach adjustment for the steering column and better lateral support for the front seats would go amiss however. Thankfully equipment levels on this top spec model were generally good if a little patchy in areas. For example Ipod/USB connectivity for the stereo and parking sensors would be a welcome addition. Suzuki knows how to make small, rough and tough off-roaders as they have been doing it for years. This latest Vitara is no exception. I tested it in deep mud and rutted hilly terrain. In all cases it excelled thanks to its various lock modes. It very rarely lost traction and when it did a quick change to the diff setting and it was straight out of the mud. More impressive was that this particular Vitara was fitted with road tyres. Whichever way you look at it the Grand Vitara is head and shoulders above its peers in this area. 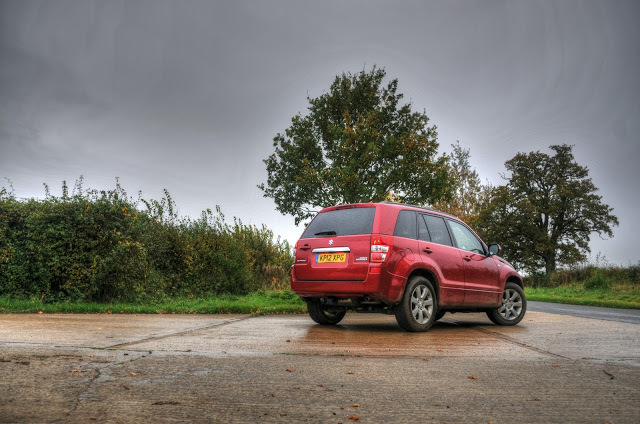 Whilst with me the Grand Vitara proved that there are still cars out there that ‘does exactly what it says on the tin’. In keeping with Suzuki’s ‘no nonsense’ image the Vitara is a very decent long distance companion and is equally capable off-road. It also seems to have aged very little despite its relatively lengthy product life. Sure it isn’t perfect, the gearbox is agricultural, equipment levels are patchy and economy could be better. What it does offer is plenty of space, a well-built interior, very good on-road handling all wrapped up in a bulletproof package that reeks of charm. For these reasons the Grand Vitara is definitely worth a look, especially considering you can park an SZ4 on your drive for a shade over £19,000.